IAEA could not secure access to Parchin military base, the site of an alleged nuclear weapons project. Iran denies that it has worked on developing nuclear weapons and says that Western intelligence findings that form the basis of the IAEA's probe on Parchin are fabricated. A new round of talks was scheduled for February 12 in Tehran. 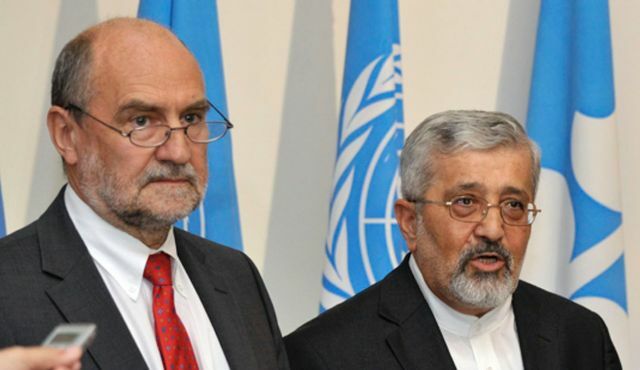 Iran analysts were monitoring the IAEA-Iran talks for any signs as to whether Tehran was ready to come to any type of agreement with the IAEA before its June presidential election. Iran has also been reluctant to agree on a date and venue for its next meeting with the world powers, despite pressures from friendly countries like Russia. If the meeting takes place in late January as now expected, it would be highly unlikely to produce any agreement between Iran and the West. IRAN is too smart to let or allow those Zionist of the U.S./Israel/the West/the Arabs-fully controlled IAEA's spies into its high-sensitived Parchin military base or complex. Indeed, no any dumb or insane nation would allow any or even a single access to such a place like Parchin's. Have Mr Naeckerts and Mr Amano pulled out their hair yet in frustration... Ha! There more to this than merely "Iran says". Iran has twice in the past allowed the IAEA to overstep its mandate and visit the Parchin military complex based on false allegations. And the inspectors found nothing. For some reason, Western newswire sources always fail to mention this. The only thing the sanctions have accomplished is to offend Iranian honor. The decision makers in Tehran won't budge. Like an Iraqi general once said "The Iranians are hard-headed and very resilient and won't give up until you give them the so called red-eye". The Iranian government is not using previous IAEA visits to Parchin (I believe in 2005) as a reason now for denying access to the site. I am not sure how old is the alleged intel on weaponization project, but if it is after 2005, then the argument would not be as important. "IAEA Former Inspector: No Evidence of Iranian Nuclear Weapons Activity at Parchin"
Interesting interview with Bob Kelley whot is a nuclear engineer worked for IAEA and done inspections in many countries, including Iraq. He worked for the IAEA in '92 and '93, and again from 2001 to 2009. He has worked at the Los Alamos National Laboratory in the U.S. for 25 years. I am very glad that Mr. Pyruz has mentioned what western mass media drops quite purposefully. Another example of it is when BBC Persian drops Majlis's decision to expel England's ambassador to Iran, when reporting on closing down of UK's embassy in Tehran. So far, Iran for its cooperation with the IAEA has only benefited in the form of total sanctions as opposed to rights of the NPT's members. In the West they have saying that "one is not quilty until proven "except the Guantanamo and other cases". The IAEA has compromised its reputation when backed the false claims against Iraq, so this time they (IAEA) has to submit sufficient evidence supporting their claims like it was suggested by Iran in order to get extended cooperation. As long as sanctions are in place it is naive and impertinent to expect any extended "priviledges" for the IAEA actions against Iran.